The Parade That Nobody Comes Out To Watch! 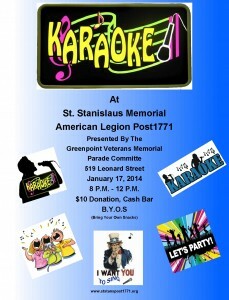 The Parade Committee is proud to announce that the 14th edition of our community parade will step off at 9:00 A.M. from St. Stanislaus Memorial American Legion Post #1771 on Sunday, May 25th, 2014. It will proceed up Manhattan Avenue to St. Anthony’s Church, where the 9:30 Mass will be offered for ALL Veterans, living and deceased. The parade will then re-form outside the Church at approximately 10:30 A.M. and march down Manhattan Avenue and return to the Post. At 11:00 A.M., there will be a brief memorial service, with a flag-raising and the playing of Taps. Once again, the parade sponsors, Lexington Council #293 of the Knights of Columbus, St. Stan’s Post #1771, American Legion and the Greenpoint Lions Club invite all community residents to march to honor our Veterans or stand on the sidelines to cheer our active-duty military members. The parade, which in the past has featured such notables as then-Congressman Anthony Weiner, Mayor Michael Bloomberg, City Council President Christine Quinn, Borough President Marty Markowitz, TV News Anchorman Marvin Scott and Mrs. Maureen Murphy, Mother of Medal of Honor Recipient, LT Michael Murphy, welcomes the return this year of 20 U.S. Navy Sailors, 20 U.S. Marines and 10 U.S. Coast Guard active duty personnel from the ships visiting New York City for Fleet Week. Last year, Defense Department budgetary considerations precluded their participation. New York State Comptroller Thomas DiNapoli is tentatively scheduled to join us this year as well. On this 70th Anniversary of D-Day, the Parade Committee is proud to announce that 93-year-old World War II Navy Veteran, Gerald Cardinal, will march in the parade as Grand Marshal. The parade will also honor 95-year-old World War II Army Veteran (1941-1945), Michael Cupak, a local resident and member of the Knights of Columbus and St. Stan’s Post. The retiring Commodore of the Knights of Columbus 4th Degree Color Corps, John “Moe” Maloney, will also be recognized for having led each of the 14 parades! There will be pipe bands and the band from PS 257, some 43 strong! The parade welcomes, for the first time, members of the Polish Professional and Businessmen’s Association. Returning marching units include the Navy Junior Reserve Officer Training Corps Unit from the High School of Graphic Arts in Manhattan, contingents from our local schools, the Ladies Ancient Order of Hibernians (celebrating their 75th year) and our local Boy Scouts. Fire engines, Police cars and motorcycles will round out this year’s parade. This parade, unfortunately, has the distinction of being the least-watched parade in the city. We realize it takes place early in the day, but the centerpiece of our parade is the Mass of Remembrance of ALL Veterans, of ALL Wars past and present, who have made many sacrifices, in some cases, the ultimate sacrifice, to preserve our nation’s freedoms. We encourage everyone to come out, and bring the children so they can understand and appreciate the role our Veterans played in the defense of our nation. (A little secret – a great viewing spot is right in front of the Peter Pan Donut Shop – bring a Flag! Raise a cheer!) We hope to see somebody – anybody – next Sunday! Come out and be proud of your native (or adopted!) country. Give a Greenpoint, Brooklyn welcome to 50 military members from all across the United States! Last night February 15, 2014 the parade committee held A Night At The Races fundraiser for this year’s parade. Despite the weather the the event was a success. Below is a video of the 9th race. You see the photos HERE. Department Of the Navy has put out preliminary information for Fleet Week 2014. The Greenpoint Veterans Memorial Parade Committee, Night At The Races & BBQ. Last night The Greenpoint Veterans Memorial Parade Committee held their annual Night At The Races & BBQ to raise funds for the upcoming parade on May 26, 2013. The turnout was great and fun was had by all. Three new links have been added to the Parade Photos section.